Lindsay, consistently living in the shadow of her beautiful twin sister has worked hard to build her career and when she’s on the verge of being named VP, she ends up loosing not only the position, but her job as well. She flees New York, returning home and finds her sister, Alex, doing better than ever and the jealousy she’s always felt towards her sparks even further. Lindsay tries to stay the smart and responsible sister while salvaging her career, rebuilding her life and trying to figure out her relationship with her sister along the way. I liked The Opposite of Me, but I’m afraid I didn’t love it as much as I wanted to. There are rave reviews for this debut, but unfortunately I was disappointed. Pekkanen’s writing has been compared to Jennifer Weiner and Emily Giffin, and while I could see that, it fell flat with me for several reasons. I don’t know if it was because of all the hype surrounding this release, but it definitely didn’t blow me away as much as Jennifer Weiner’s Good In Bed, but then again, not much could live up to one of my favourite chick lit novels. I really enjoyed Pekkanen’s voice. It was fresh and felt like a friend was telling me a story which made the novel easy and fun to read. The first part of this chick lit tale, set in New York City, flew by and I felt the frantic life Lindsay led with her long hours and pressure to advance her career. When she moved home, I immediately felt the change of pace and thought this was very well done by Pekkanen because it was such a dramatic change. The beginning of this novel had me hooked, but it was once she left for home that things started unravelling for me. I became annoyed at Lindsay’s jealousy of her sister and at times didn’t understand it, maybe because we weren’t shown any actual interactions with Alex for such a long time so I couldn’t see firsthand why she felt this way. I don’t have any sisters, so was left wondering if that’s why I couldn’t relate, but Kathryn does and she felt similarly. And to be fair, I actually didn’t relate much to Weiner’s In Her Shoes either, so maybe novels about sisters don’t engage me much. This chick lit tale wasn’t as predictable as I feared it might be part way through, which was nice, and I enjoyed several of the other characters, but found they were lost in the shuffle. First her parents, who I thought were charming and funny, but I wanted more from them, especially towards the end of the story when a family secret was revealed. I also really liked the friend she made along the way who also seemed to disappear from the story without a trace as well as some of her new clients. The focus shifted towards her sister, which was to be expected with the storyline, but I missed seeing these characters and I found the ending abrupt as it all wrapped up too neatly and quickly. The Opposite of Me explores themes of sibling rivalry, expectations and assumptions of oneself as well as family and I questioned my own family history and relationships with my brothers. Although I felt something missing with this novel, or whether I missed something myself, I’ll definitely read another novel by Pekkanen. I had high hopes for this one as it appeared to have been given a lot of praise but I wasn’t all that wowed. It’s a classic tale of single girl lit full of trials and self discovery. At first I enjoyed the main character’s career in advertising in New York. She is completely engrossed in her job though so there is nothing else in her life. I found this interesting I suppose because it is so unlike me to be so detached from anything outside of my job. Unfortunately the same things I found interesting also became a bit annoying. She complains a lot about her twin sister and they don’t have any sort of relationship. I just couldn’t imagine how that would be possible and when her career derails and she decides to pack up and move back to her hometown it didn’t make sense to me why she would move back to a place with a family she didn’t have a connection with? Once she moves home we are thrown all over the place with her search for a new career, a new life and her obsession with an old boyfriend. I felt it was disjointed and that there was a focus on some details (like her connection to some of her new clients - one of the few parts I liked) which then disappeared from the story-line. I liked the woman she began working for though and would have liked a firmer relationship to be given to us. I also liked her friend Matt from New York, but found the old boyfriend was a bit blank- the potential for that character was there & started off well but then sort of died off towards the middle. In the end the relationship with her twin and her parents is settled but I felt everything else was left a bit unfinished. So I was disappointed. 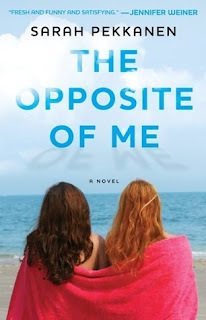 The Opposite of Me was written really well and it was an easy read so I’m sure that I would be happy to try another Sarah Pekkanen novel in the future.